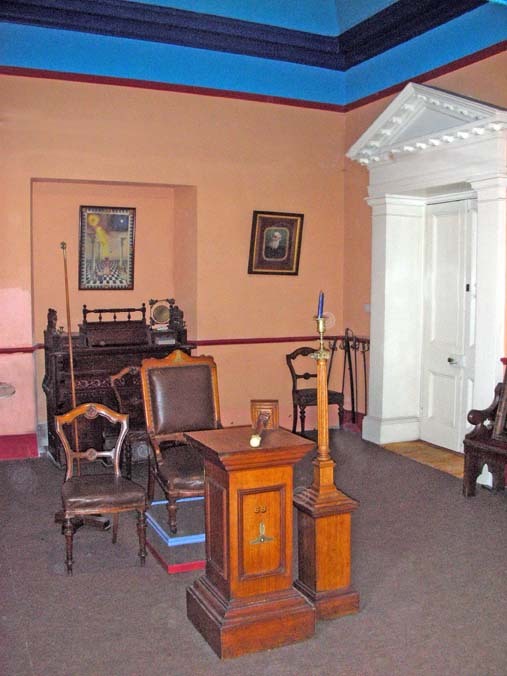 One of the first references to a Masonic lodge in Ireland occurred in the year 1695, when a Major Congreve ” agent to the Burlington estates (now owned by the Duke of Devonshire)“ formed a lodge in the town of Youghal. This lodge would seem to have formed the nucleus for No. 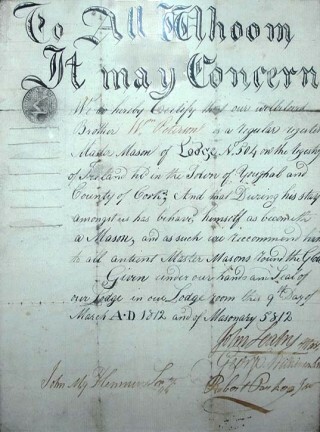 19 ” warranted in 1733 ” which met at Youghal until it went into decline in the 1820s, and had its warrant was returned in 1830. For a period, No. 504 ” transferred from Skibbereen in 1807 ” was the only lodge of the town, and continued in the town until 1851. No. 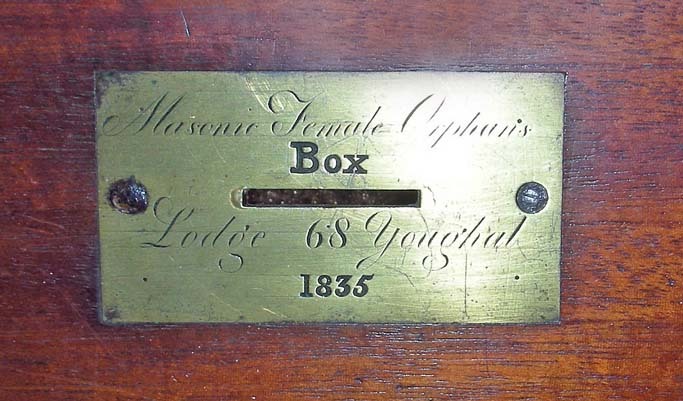 68 ” formed in 1835 ” eventually inherited many of the lodge furnishings and fittings of this ancient lodge. Our Worshipful Master’s chair dates from 1762, as testified by the date carved under the left arm of that chair. 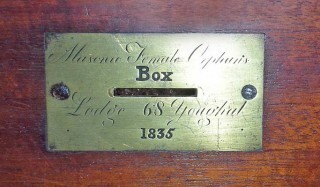 The lodge box and oil-on-canvas tracing boards also date from that period. Youghal was an important walled port, so that it comes as no surprise that Masonry was early represented there. However, to also hold the record for the earliest authentic reference to the Royal Arch in Ireland ” 1743 ” is quite a record. Indeed, Masonry was so highly regarded at Youghal that from the mid-eighteenth century, when Thomas Mathew was Provincial Grand Master of Munster, his deputy was always drawn from Lodge No. 19 in the town. 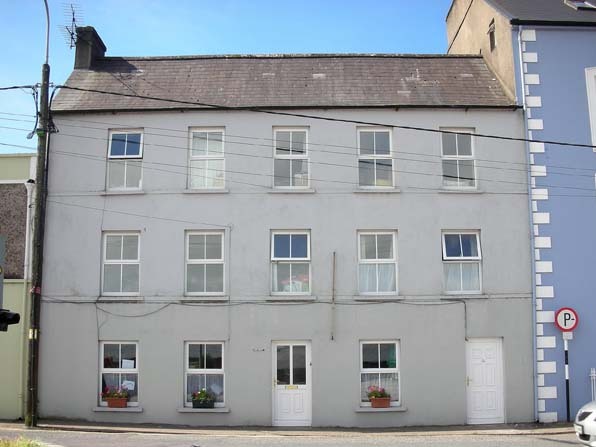 For a period until as late as the 1860s, Youghal No. 68 had a Knights Templar warrant attached, as had No. 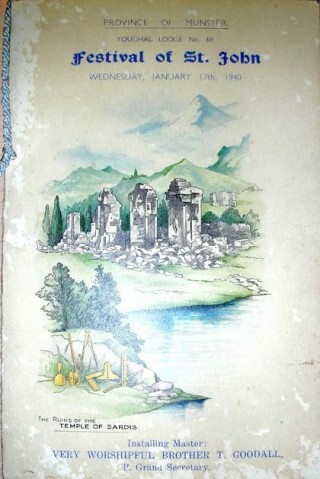 19 previously, a relic of which can be observed one of our three ancient oil on canvas tracing boards. In 1844, Youghal No. 68 held their installation of officers and dinner at their lodge room in the Devonshire Arms Hotel. This was still their meeting venue in 1853, while by 1860 they had changed to the hotel of a member ” Brother William Flynn. The background to this movement through meeting premises is partially revealed in the minutes. In December 1859, it was ‘proposed that a committee be formed to take the matter into consideration as to whether it would be for the advantage of this lodge to remove it to a private house or let it remain as present [meeting at the Devonshire Arms].’ Later that month, the committee reported favourably as to the new lodge room at Mrs. Foley’s, whereupon the Worshipful Master ordered the removal of the lodge chests, chair, etc. to this venue before the end of the month. In 1862, the lodge rooms were located at North Main Street, and in 1863, lodge was meeting in the house of Mrs. Sidley, but having got into some difficulties at that venue, the lodge was compelled to move to the house of Brother Hannan on The Mall, where a suitable room was offered. It is recorded on July 7 1863 that the secretary was instructed to write to the P.G.M. for his sanction to remove to the new venue, while the committee of brethren would meet with Brother Hannan concerning settling the lodge room. These minutes record the eventual move to our present meeting premises, of which the lodge took possession of a lease in 1863. Meetings continued in the premises until, in June 1869, a communication was read from Brother Hannan, concerning making improvements to the lodge rooms. A committee was formed in September of that year for the drawing up of plans and collection of funds with the result that by February 1871, ‘it was resolved that the committee of improvement be empowered to arrange with Brother Hannan as to the purchasing of his interest in this premises in which the lodge rooms are situated’. This deed of assignment was undertaken on April 4 1871, and since that time, the lodge has ownership of the entire premises. From its foundation, until the 1920s, many military and merchant personal attended and obtained membership of lodges in Youghal. Reference can be to various regiments in the minute books, particularly the 52nd Religment of Foot, some of whose members were listed as members were listed as masons as far back as 1763. After 1922, the old military garrison barracks, near the top of Cork Hill, was converted into the local District Hospital. From the 1920s until the 1940s, membership remained static and consisted of mainly local individuals. In the 1950s and 1960s, a number of candidates came in who were employed in the new textile industries set up in the area. Many were English technicians, brought over to set up these new factories and train local operatives. While these new members were most welcome, the majority moved on and were lost to No. 68. The recession in the textile industries resulted in a number of closures, which were partly to blame. In the early 1950s, considerable repairs were carried out to the ‘House’ portion of the lodge premises, as well as to the lodge room itself. An appeal was made to lodges in the Province to help in paying the contractor for this work, and in addition, the lodge was fortunate in obtaining a tenant for the house who completed a lot of the internal repairs himself. In September 1982, the first floor lodge room at the rear of the premises was vacated and all furniture and regalia moved to the ground floor where lodge was to meet for the period the upper room underwent renovations and repairs. Work parties were organized and a great deal of work was carried out by members and affiliates who came voluntarily on numerous occasions. The greatest thanks is due to all these men for their dedications and support. 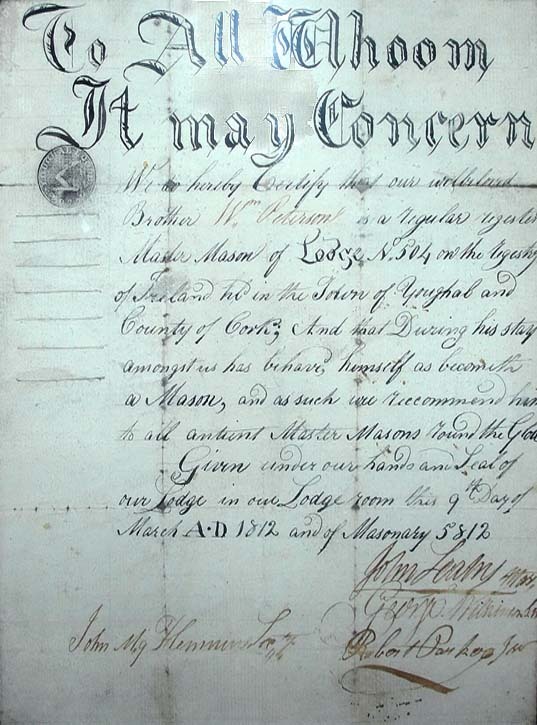 Contractors were engaged to carry out essential external and internal repairs, and a general appeal was issued to all lodges in the Irish Constitution with the approval of Grand Lodge ” the last time such an appeal was authorized, as new methods of assistance were introduced shortly after ” with the result that over £8,000 was contributed, besides what was raised from social functions held within the province of Munster. During 1983, it became essential to carry out additional work, rebuilding the rear gable end wall, attending to external plastering and guttering, with the result that funds ran out and it was not possible to reinstate the first floor lodge room at this point. Matters remained dormant for a number of years ” meetings continuing on the ground floor ” with few new candidates admitted until 1987, when a number came in. This encouraged members to the degree of application to Grand Lodge for a grant and a loan, which being successful enabled the Lodge Room and annex to be completely refurbished. The Masonic Hall was rededicated on 17 October 1990 by M.W. The Hon. Marquess of Donegall, L.V.O., Grand Master of Ireland at that time. A large and representative gathering of brethren attended and witnesses a most memorable and historic event in the history of Freemasonry in Youghal. The generosity of members over the years has enabled No. 68 to repay the loan and continue working in its historic premises. We retain a tenant in the premises and have recently undertaken further repairs and upgraded the premises. We welcome all visiting brethren to visit when in the area, where a warm welcome is assured.